Thum! Kaun Aata Hai? : FGFA License Production Preferable, Hints Russian Official? FGFA License Production Preferable, Hints Russian Official? FGFA scale model at Aero India 2013. 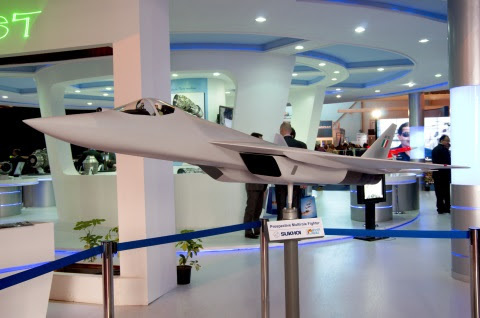 An official of Russia's UAC, the group that owns Sukhoi, hinted that license production of FGFA maybe a better option for India than co-production. He cited the success of the Su-30MKI program. UAC's Mikhail Pogosyan told Russian news agency TASS on Tuesday that no timeline could be projected for finalization of the FGFA contract between India and Russia because of differences. "There are several issues related to the organization of the work, the terms, the cost and technical details. This requires certain time and the corresponding coordination procedure at the level of governments of both countries,” Pogosyan said. It could be the translation. Or it could be a hint!. Anyway, as is the case with Brahmos, labeling FGFA as co-development is a farce. It's unreasonable for India to expect Russia to part with stealth technology for just $5.5 billion. Paying them more would not help either. What would really help is stepping up funding for the AMCA!